If you are an average Samsung Galaxy S5 owner, i.e. without expert knowledge of the phone's hardware technicalities and software configuration, I suggest you learn how to boot your phone to Safe Mode and Recovery Mode. You may not be able to use them that often but, at least, you have a know-how in case your phone may encounter a problem that requires to use any of the methods cited here. This post will teach you step-by-step how to boot your phone to Safe Mode, Recovery Mode, wipe cache partition, and perform Factory Reset. I will also try my best to explain briefly the importance of these methods and when to use them. I divided this article into sections so it will be easy for you to find information relevant to what you're looking for. So, just click any of the links you can find after the break. Booting the phone to Safe Mode will temporarily disable all third-party apps and services. This is very important when you're troubleshooting problems that may have been caused by applications that gone rogue or crashed. Apps that can't be opened in normal mode can easily be disabled or installed while the phone is in this state. Some glitches in the firmware can also be fixed by simply booting to Safe Mode that is why it is imperative you put the phone into this state just before you perform factory reset. It will save you from a lot of trouble of backing up all your data. Turn off the Galaxy S5 completely. Press and hold the Power button until the 'Galaxy S5' logo appears on the screen. Just the logo appears, immediately press and hold the Volume Down button while releasing the Power button. Continue holding the Vol Down key until the phone is finished rebooting. If you were successful, you can see 'Safe Mode' on the lower-left corner of the screen. You may release the Vol Down button now. In case you failed, just turn the phone off and repeat the process. To turn off Safe Mode or to boot to normal mode again, just press and hold the Power button and choose Restart. There are times when the phone is stuck in Safe Mode. This issue may be caused by a glitch in the firmware. If this happens, just remove the battery while the phone is on and press the Power button for 30 to 60 seconds, and then place the battery back and turn the phone on. If it failed, you may proceed with wiping the cache partition, which will be explained in the next section of this post. Even if your firmware fails to load as long as necessary Android files are intact, you can boot to Recovery Mode. Consider this state as your fail-safe in case your Galaxy S5 enters the boot loop or refuses to boot up successfully. More often, these problems are caused by firmware glitches preventing some necessary files and data to be loaded normally. Booting to Recovery Mode alone won't fix problems. You have to do something while the phone is in that state. There are two very important procedures you can do in Recovery; wipe cache partition and wipe data or factory reset. Press and hold these buttons together: Volume Up button, Home key and Power button. Immediately after the phone vibrates, release the Power button but continue holding both the Vol Up button and the Home key. Once the Android System Recovery screen shows up, release the buttons. To navigate through options, press the Volume Down button. To choose the highlighted option, press the Power button. The cache partition is basically a directory or a folder that contains caches stored by the Android system to be used the next time you use a service or an app. I know the Galaxy S5 is a powerful smartphone that apps are loaded almost instantaneously but there is actually a difference in load time when you run the app the first time. After the first run, Android already stored cache in the cache partition that is why apps are loaded faster. Users can't access the cache partition without special permission (that can only be provided by rooting process). The only time a user can delete the cache of an app is by going to the app manager and hit the Clear Cache button or by booting to Recovery and choose the 'wipe cache partition' option. Don't worry, the system will cache new data when it detects previous caches were already deleted. There are times when caches become corrupt and would disrupt the normal operation of the phone. When this happens, the phone may refuse to boot normally. In the case of the Galaxy S5, the most common behavior is that the screen is stuck on the Samsung logo. Some may experience boot loops, i.e. the phone powers on when the Power button is hit but it would turn itself off and on again, thus, completing a cycle that would never end unless it runs out of battery or interrupted by the user. Turn the phone off and boot to Recovery Mode. While in Recovery, press the Volume Down button until the option 'wipe cache partition' is highlighted. Press the Power button to select 'wipe cache partition'. It would take only a few seconds to finish and you will be brought back to the same screen. Now, highlight 'Reboot system now' and press the Power button. Wait for the phone to finish rebooting to normal mode. Factory reset is also known as Master Reset, Hard Reset and Full Reset. But it basically means one thing, to bring the phone back to its default or factory settings. All your apps, widgets, contacts, messages and even data stored in the phone's storage (NOT the microSD card) will be deleted indiscriminately without the possibility of being restored. Therefore, it is imperative you properly backup everything that is stored in your phone before doing this procedure. This is the most common way to do master reset. What it does is actually delete all user data like third-party apps, contacts, messages, etc. and it is very effective in addressing problems like freezes, slowing down of the phone's performance, and app crashes. Scroll to User and Backup section and tap Backup and reset. If desired, tap Automatic restore and Back up my data to clear the checkboxes. The phone may prompt you to enter your PIN or password depending on your screen lock configuration. To confirm your action, tap Delete All. 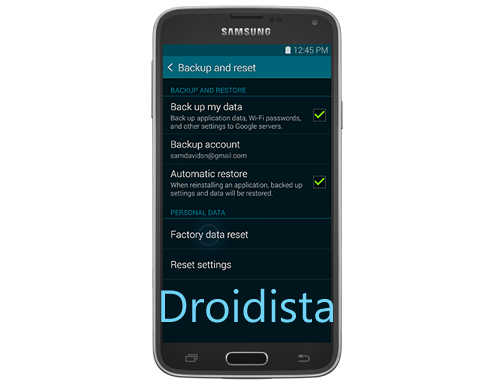 If you booted your Galaxy S5 to recovery mode, you can see an option that says 'wipe data/factory reset'. It means the data partition will not only be wiped of its contents but reformatted to get rid of other data fragments that could potentially interrupt the phone's normal operation. This process is often referred to as 'Full Factory Reset' and the previous one is 'Partial'. As an average user, you may not be able to tell the difference but let me put it this way, this procedure is more effective than the other when troubleshooting problems that may involve both hardware and software. Turn off the phone completely and boot to Recovery Mode. When in recovery screen, use the Volume Down button to highlight 'wipe data/factory reset' option. Highlight the option 'Yes -- delete all user data' and press the Power button. Factory reset takes more time than wiping cache partition, so be patient and wait until the process is finished. Now highlight 'Reboot system now' and press the Power button. Note that the phone may take longer to reboot this time now that all data were deleted. Don't you know that the phone app or the Dialer does more than just call people? You can enter codes to command the phone to do some tasks without actually going through the hassle of finding them in the Settings menu. The same is true with Factory reset, you can dial a number to reset your phone. Pull up the Phone app. *#7780# - it deletes all your data and functions like doing factory reset via the Settings menu. *2767*3855# - it deletes all your data, reformat data partition, and works like Factory Reset via Recovery Mode. Having troubles with your phone? Feel free to contact me at harold@droidista.com and I will do my best to help you find a solution. Make sure you provide all necessary information like your phone model, Android version (especially if you suspect your firmware has issues), app in question (for app-specific problems), etc. I receive a lot of emails every single day so I may not be able to respond to your concerns immediately. If you want, you can join the Smartphone Support community [click here to join] I created solely for this purpose. I often stay on that page everyday so there is a big chance you'll catch if you posted your concerns there.